Slawek moved to the US in 2002 as a Polish National 10 Dance Champion, Polish Professional International Ballroom Runners up. 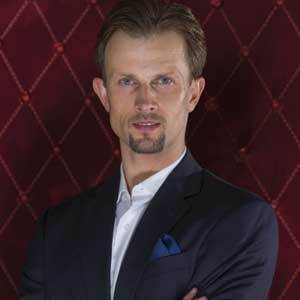 Slawek started to compete in American Smooth in 2009 and won the US and World title for 4 consecutive years 2010-2013. Winning all most prestigious competitions in United States including: United States National Championships, World Championships, Ohio Star Ball, Emerald Ball, Embassy Ball, Millennium and Manhattan Championships. Slawek and Marzena retired from competitive dancing in 2013. Slawek and Marzena appeared on the Telivision Show Ballroom Bootcamp. They have choreographed for numerous TV Shows and Movie Productions. They are currently the Directors and Owners of Dance Vision’s Mastery Camps Las Vegas. They are also owners of Dance United Ballroom Academy, in Laguna Hills, CA & Co-Owners of The Royal Ball. Slawek and Marzena are happy parents of two children.